Team O’Neil, the country’s premier rally and advanced driving school, is excited to announce a new partnership with Method Race Wheels and their line of racing inspired, performance tested race wheels. Team O’Neil is excited to announce a new partnership with Method Race Wheels and their rally and off-road wheel collections. Method Race Wheels will become the official wheel for Team O’Neil’s school fleet of over seventy cars across various brands and styles. With this new partnership, Team O’Neil will be a Method dealer for all of their customer’s custom wheel needs. Method Race Wheels are developed by racing enthusiasts and participants who are committed to developing the finest quality off-road race wheels through engineering, rigorous tests, data collection and proven performance. Method looks beyond the conventional ideas of industry standards and redefines what’s possible with wheels. Method is driven by standards of performance and their application of race knowledge separates them from other wheel companies. "We are excited to partner with one of the premier rally schools in the world. Team O’Neil has a fleet of cars which will provide us with R&D information on vehicle platforms and brands we have yet to use our product on. The alliance will get our name and product into race series classes we have been targeting along with use in the school setting which is often times more harsh than a race with a professional driver. We believe in testing our product in the most rigorous way possible to ensure our customers are getting the best and Team O’Neil’s school and racing programs will help us to continue to develop top level racing wheels," says Sean Kleinschuster, Engineering Manager at Method Race Wheels. Team O’Neil is widely recognized within the Rally racing community as one of the most successful Motorsport brands in the industry. They have dominated the two-wheel drive Rally America Championship for nearly a decade. 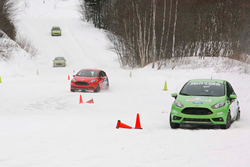 In addition to the Team O’Neil / Ford Racing Motorsports division, the Rally School – located in Dalton, NH on 600 private acres – has been teaching advanced driving techniques to race champions from almost every motorsports discipline, military and security personnel, and the general public since 1997. They are considered the premier rally racing school in the U.S. For more information, visit their website. Method Race Wheels can be seen on and off road with lines spanning from street wheels, race wheels, UTV wheels and rally wheels to custom wheels. Their wheels have raced their way through well known races such as the Rally America series, Best in the Desert series, Dakar, King of the Hammers, and the Baja 1000. To see Method’s complete line of race wheels visit their website.